The amazing Peter Fallon (a renowned publisher in addition to being an award-winning poet) was at The Bookworm in Beijing on Tuesday to give a reading and answer some questions about his work, and as you might expect he was his exceptional self, respectful about his serious art while remaining engaging, humorous, and generous. Somehow, I got a chance to read some of my work as one of three openers for Peter. 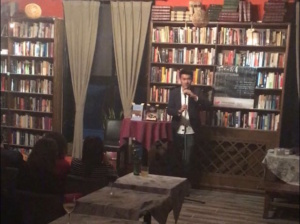 For those who weren’t among the fifty people at The Bookworm, I’ve embedded the audio from my reading. Fast-forward to the 1:12 mark for when the poems start. If you liked any of these, hop on over to my poetry page for more. 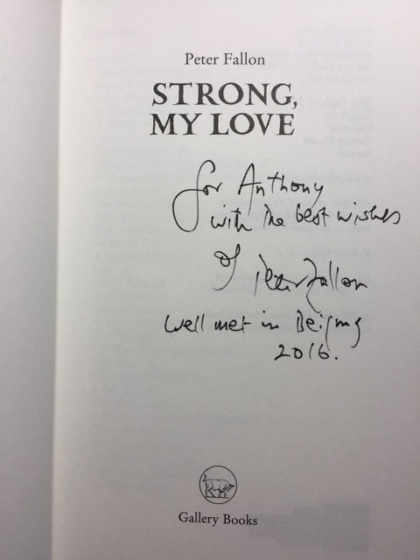 And of course, get your hands on Fallon’s latest collection, Strong, My Love (2014). I’m on it now, and it’s excellent.